to buy sacks of onions, boxes of tomatoes, green bananas and irish potatoes. Ritah benötigte 550 US-Dollar, um ein Gewerbe im Bereich Nahrungsmittel auf- oder auszubauen. Das Geld wurde gesammelt und für Ritah bereitgestellt. 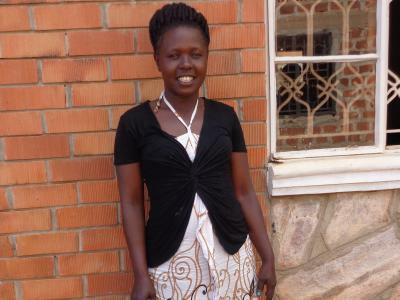 Ritah is 23 years old and lives in the town of Seeta in the Kireka region of Uganda. She is married and has 3 children who are all currently in school. For the past 4 years, Ritah has been working hard to manage her food stall, which sells tomatoes, green bananas and onions. To help expand her business, Ritah has requested a loan of 2,000,000 Ugandan Shillings from BRAC Uganda. The loan will be used to buy sacks of onions, boxes of tomatoes, green bananas and irish potatoes, and will help Ritah to generate greater profits. Ritah will use the profits to assist her husband in paying school fees for her children, buying for them school requirements, paying house bills like electricity and providing basic needs for her family like food thereby improving on their standard of living. Ritah hopes that in the future she will be able to be a big business woman in her area. Ritah is a member of BRAC's Empowerment and Livelihood for Adolescents (ELA) program. In addition to microfinance loans, the program provides both a safe place for young Ugandan women to take part in group activities, and a forum for life-skills training.